Share your HDMITM Set-top Converter, DVD players, Video Game Stations and Computers with your Hi Def HDTV monitor. 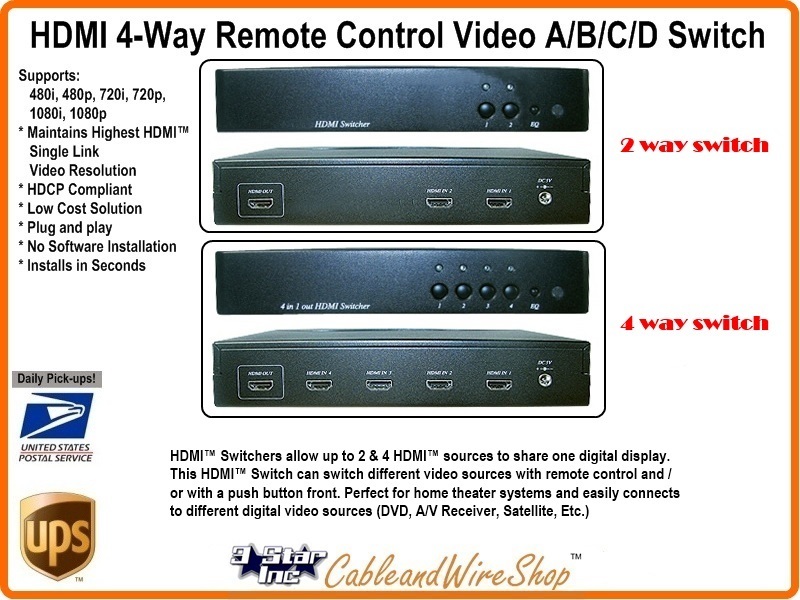 These Switches pass HDMITM 1.3 Digital and Audio Signals and HDCP data through the HDMITM ports. HDMITM is Backwards Compatible with DVI-D when the Appropriate Cables and/or Adaptors are Used... Keeping Your System Up to Date. HDMITM connects digital audio/video sources (such as set-top boxes, DVD players, HD DVD players, Blu-ray Disc players, AVCHD camcorders, personal computers (PCs), video game consoles (such as the PlayStation 3, Xbox 360, and Wii U), AV receivers, tablet computers, and mobile phones) to compatible digital audio devices, computer monitors, video projectors, and digital televisions.